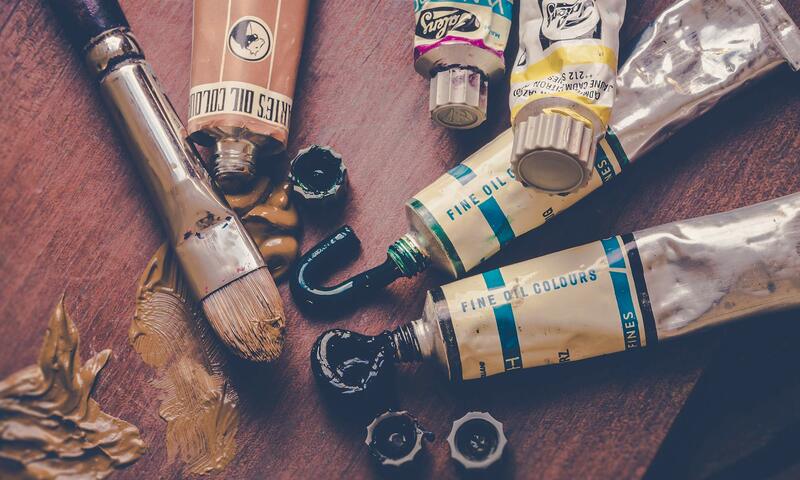 Ontario Society of Artists | Canada's longest continuing art society, founded in 1872. 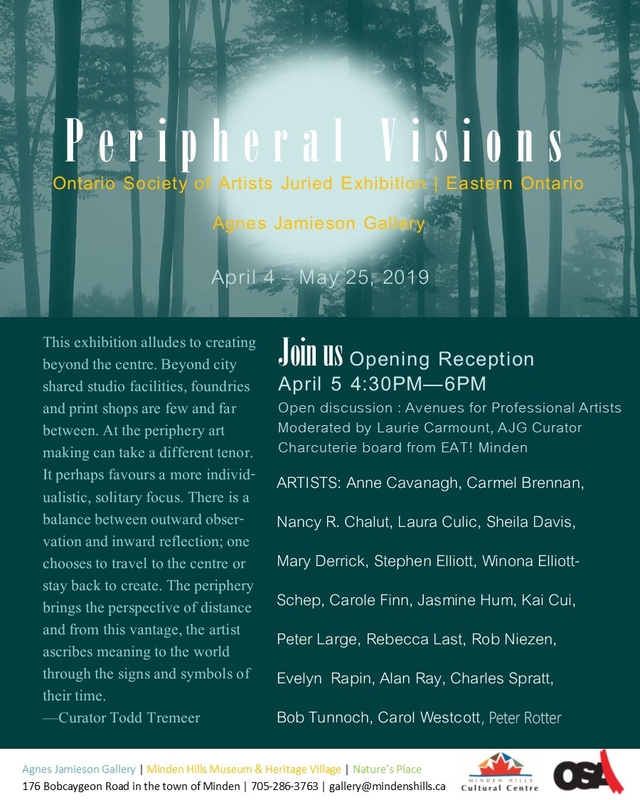 Twenty artists from Eastern Ontario are in a curated exhibition at the Agnes Jamieson Gallery in Minden Hills! Opening Reception: March 28th 6-8pm. All are welcome to attend. Elizabeth Elkin, Judy Finch, Agnieszka Foltyn, Maya Foltyn, Lawrence Glazer, Cathy Groulx, Jasmine Hum, Ronald Regamey, Clare Ross, Lori Ryerson, Kari Serrao, Steven Volpe, Micheal Zarowsky. A.M. Benz, Lori Birbeck, Kaitlin Brough, Norman Busse, Melanie Chikofsky, Joyce Crago, Lucien Duhamel, Wayne Gascho, Colin Hill, Lisa Johnson, Deborah Kanfer, Jean-Christian Knaff, Claude Miceli, Richard Mongiat, Guiseppe Morano, Chris Myhr, Neli Nenkova, Teodora Pica, Christina Sealey, Graeme Skelton, Michael Stecky, Dara Vandor, Elayne Windsor. 2019 Eleanor Besen Award: We are very proud to announce that the late Tony Vander Voet, a beloved Past President, is the recipient of this award. 2019 Ethel Raicus Award : We are also pleased to announce Katie Luu as the winner of this award for her sculpture “Tremble”, Plaster of Paris, 36″ x 12″ x 8”, NFS. For this stunning show of contemporary art, esteemed jurors Odon Wagner, David Liss, and Diana Bennett selected 36 works from over 500 submissions. We would like to thank our volunteer team: Pat Dumas-Hudecki (Chair), Lisa Murzin, Frances Patella, Dominique Prévost, and Alan Douglas Ray. OSA Members’ Exhibition of Selected Works — PaperMill Gallery, Toronto — October 3rd to October 28, 2018. Eighty-six member artists participated. Juror: Darrin Martins. Chair: Steve Wilson. OSA Members’ Exhibition of Selected Works – Carrier Gallery – November 2017 (Co-Chairs: Tony Vander Voet & Susan McCrae). The call for entry can be found here. 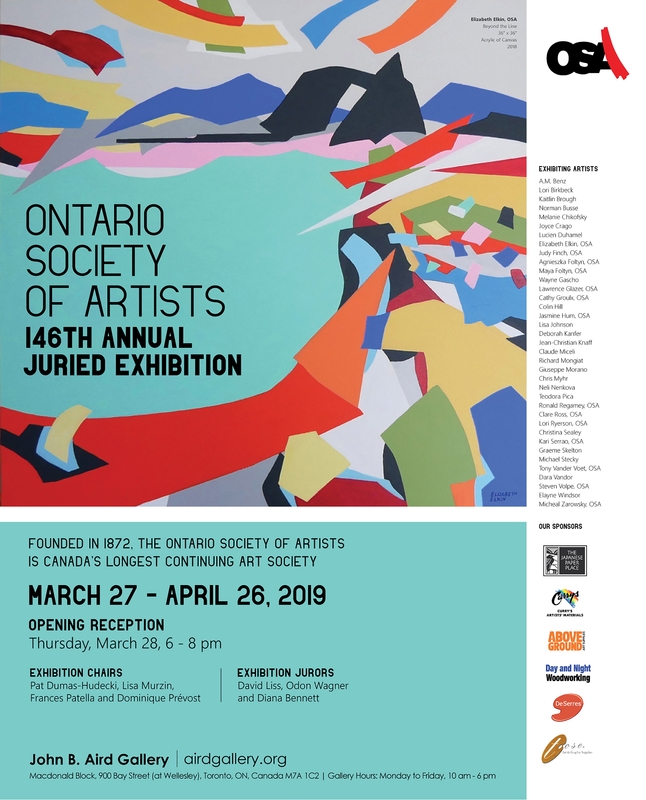 The feature image above is from the OSA’s 145th Open Juried Exhibition at the John B. Aird Gallery. Keep Informed by subscribing to the OSA Mailing List for news and newsletters.